LUX* Resorts & Hotels, is announcing the opening of four new properties by 2017 in the Indian Ocean, China and the Middle East, as well as the complete refurbishment of LUX* South Ari Atoll, Maldives. The second boutique hotel along the LUX* Tea Horse Road circuit is set on the edge of the Yangze river and is located in the core of the sun-drenched valley of Benzilan in the Yunnan province of China. The LUX* Tea Horse Road links Benzilan to its sister property in Lijiang, with a carefully defined route that follows the original path of the ancient trade route. LUX* Tea Horse Road Benzilan welcomes travellers making their way to the sacred glaciers of the Meili Snow Mountains to a pristine, Tibetan-inspired 30 rooms mountain-retreat hotel offering unparalleled views of the snow-capped peaks of Baima Snow Mountains, surrounded by tranquil Tibetan villages at the shores of the Yangtze River. LUX* Sud Sauvage located in the “green corridor”, referred to as the island’s best kept secret, on the stunning Côte Sauvage,and just a short distance from La Fournaise volcano. The exciting resort concept is based on private villas, each with their own pools, offering total peace and privacy. LUX* Sud Sauvage will be an eco-resort nestled in lush tropical greenery, set to welcome discerning travellers in search of authenticity, unpretentious luxury and charm. The resort’s landscape boasts over 8 hectares of tropical gardens for guests to lose themselves in local and exotic fauna including rare, protected orchid species. Located in the North Malé Atoll, this ultra-modern luxury island resort will comprise of spectacular private villas perched above crystal waters, each with their own private pool, breezy in-outdoor living spaces and wraparound decking. 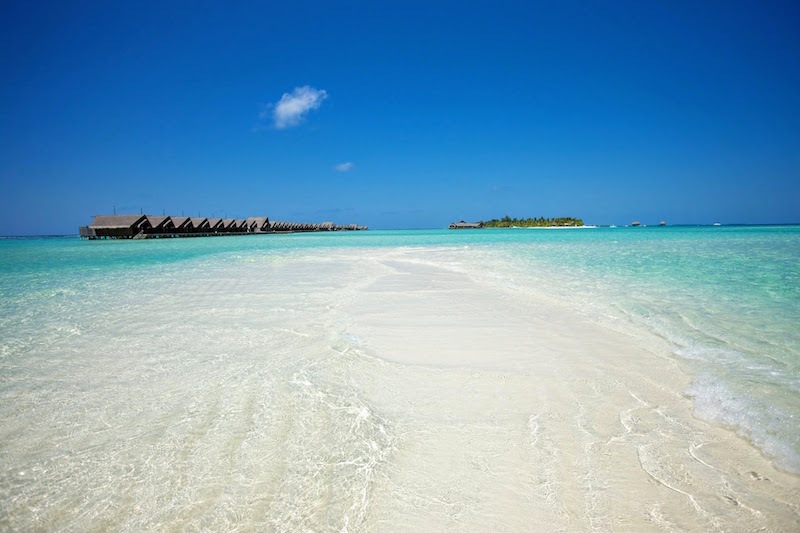 Less than an hour away by speedboat from Malé and the international airport, LUX* North Malé Atoll is only 31 nautical miles (56 kilometres) north of the capital of the Maldives. Miaja Design Group took architectural charge of the hotel design, using hand-polished woods and other natural materials, alongside ample glass to allow natural light to flood in. With the idyllic location amid an unexplored reef teeming with extraordinary sea life, LUX* North Malé Atoll takes its style cues and interior design from the nautical world. An on-site environmentally conscious marine biology centre will invite guests to discover all that nature has to flaunt in that part of the world. LUX* Al Zorah will be LUX* Resorts & Hotels’ first venture into the Middle East. This sleek destination resort is an easy 30-minute drive from Dubai International Airport. Designed with a blend of modern Arabian grandeur and signature LUX* simplicity by esteemed hotel architect Jean-Michel Gathy, the 191 rooms, suites and private villas guarantee guests contemporary glamour on the Arabian Gulf. Al Zorah is a biodiverse coastal oasis, and home to around 60 bird species (including the extraordinary pale pink flamingo). Twelve kilometres of silky sandy beach surround the resort, offering a wealth of outdoor-adventure possibilities, and plenty to tempt guests outside their sumptuous accommodations – diving, boating, kite surfing, fly boarding, and teeing off at the Jack Niklaus signature 18-hole golf course are all on the agenda. In addition, LUX* will manage 60 branded luxury residences that will enjoy all of the resorts facilities. LUX* South Ari Atoll (formerly known as LUX* Maldives) will launch the ultimate overwater love retreats, each with a private pool. The private villas and suspended infinity pools blend contemporary flair with cabana charm. LUX* South Ari Atoll enlisted the expertise of award-winning design practice P49 DEESIGN, to inject new life into the resort. The new Signature Water Villas were conceived with love in mind, giving an entirely new meaning to ‘romantic breaks’. The unique directional architecture these hideaways will not only look chic and progressive, but will feel relaxed, serene and ever so romantic. In addition to the LUX* ‘Sleep Tight’ bed guests will love the couples rain-showers, unique ‘loveseats’ and overhanging ‘love nests’ that float in the air over the lagoon. A magical hang out for couples to luxuriate in complete privacy and seclusion. Subaquatic explorers can take one step from the villa’s balcony directly into the shallow lagoon waters considered the only one in the world with a year-round presence of friendly whale sharks. You might spot one that never been seen before and have the chance to give it the name of your choice.